1. Be thankful for family. We are all where we are today because our parents or guardians raised us. Hopefully, we have taken all the positive lessons from them and are applying them to our lives. If you are married and have children, be thankful for the blessing of your family. If you are single, be thankful for your parents, aunts, uncles, grandparents, and cousins. 2. Be thankful for friends. True friends encourage us, motivate us, and push us to do better. Take time to call them and thank them for all the great things they have done. 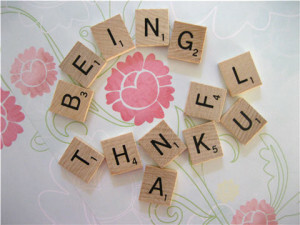 Show your gratitude by also being a great friend to others. 3. Be thankful for a home and for nourishment. If you have a home, be thankful you have a place to rest and relax. Hopefully your home is also a place of safety and encouragement. Truly show you are thankful for your home by supporting organizations who help those who have no homes. In addition, we should be thankful we have the opportunity to eat on a daily basis. If you have plenty, please show your thanks by helping to support agencies that care for the hungry. 4. Be thankful for laughter. Laughter is a gift from God which can bring great joy. Be thankful for the laughter of children, a spouse, or friends. 5. Be thankful for a job. A job is a great blessing, whether we are happy in the job we are in or not. Take the time to list out reasons you are thankful for your job. If you find this hard, don’t look at your job just as a means to make money, but look at it as a way to help people. 6. Be thankful for the freedoms you have. We have so many freedoms other countries do not have. It has cost some men and women time away from family, life-altering injuries, or the ultimate price – their life. Take time today to say “thank you” to someone who helped, or is helping, protect those freedoms. 7. Be thankful for those who have made a positive impact in your life. All of us have had people in our lives that have made a positive impact. It may have been a teacher, coach, pastor, youth worker, Sunday school teacher, or a family member. Be thankful that these people were placed in your life and give to others as they have given to you. 8. Be thankful for your health. If you are reading this, you are probably a person in good health. Be thankful for that. However, there may be people in your family and community that are not as fortunate. Take time to help someone this week.